Check out this Michigan-inspired holiday gift guide for those who love to hike, camp, fish, hunt and explore. Best of all, these unique items make the perfect stocking stuffers, all while supporting Michigan's great outdoors. 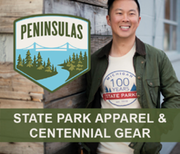 Wear your feelings on your sleeve, literally, with Peninsulas apparel that celebrates state parks in Michigan’s Lower Peninsula and the upcoming state park centennial. A portion of proceeds is donated back to the DNR. Archivists at the Michigan History Center have curated hip, vintage clothing, glassware, prints and more. Michiganology will be a hit with teachers, family and friends! Proceeds benefit the MHC. Campers and boaters on your list will love the idea of planning their next camping or boating trip in Michigan state parks and harbors. Plastic gift cards can be purchased by calling 517-284-7275 and eGift cards can be purchased online. 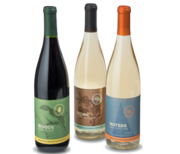 The Chateau Grand Traverse "Wines of the Great Outdoors" series (found online and in stores statewide) highlights the best in Michigan agriculture and outdoor recreation. A portion of the proceeds benefits the DNR. Ann Arbor-based Espresso Royale Coffee's five custom-labeled coffees make perfect stocking stuffers. The outdoor-inspired coffee is available in local grocery stores and online. eLicense gift certificates are the perfect gift for your favorite outdoor enthusiast. The eLicense gift certificates can be used to purchase hunting and fishing licenses, ORV and snowmobile trail permits and Pure Michigan Hunt applications. 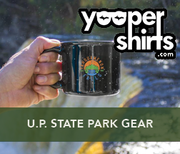 Show your love of Michigan state parks and trails in Michigan's Upper Peninsula with Yooper Shirts' line of shirts, drinkware, stickers, koozies and more. A portion of the proceeds is donated back to the DNR. Help conserve wetlands and waterfowl habitat with the purchase of a Michigan Duck Stamp. The 2018 Special Governor’s Edition Duck Stamp and Print features a pair of American wigeons. The These Goods are Good for Michigan program is a collection of partners who work with the DNR to raise awareness and support for state parks, trails and waterways. When you purchase from these businesses, you're also giving to the great outdoors! Visit goods4mi.com to get to know all of our partners.